After a wonderful healing session with Patrick Broome that focused on the South of the medicine wheel, the qualities and embrace of the mother and combined chanting, meditation, gentle movements and deep relaxation with yoga nidra (just what I needed after an intense and beautiful weekend), I went to David Lurey´s class. 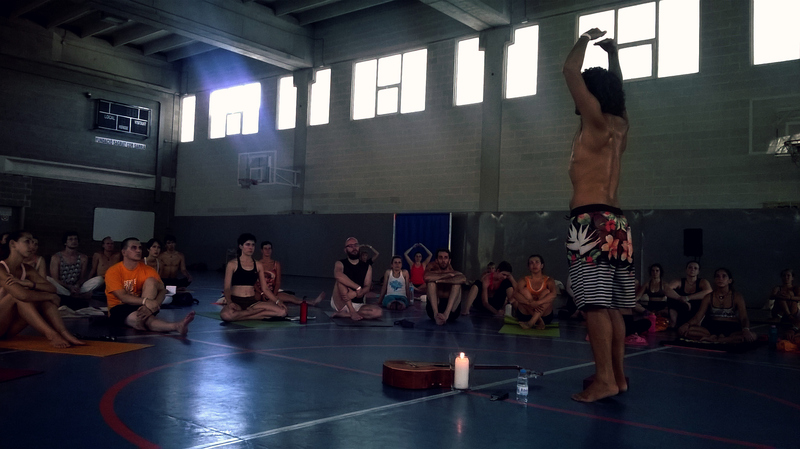 David quickly announced that it wouldn´t be a “dynamic” asana practice but mostly focused on the breath and meditation. We began by making a circle and chanting the mantra to invoke the feeling of love “baba nam, keva lam” (love is all there is). He talked about the importance of integrating all the knowledge and experience that we could have gained after such a special weekend, hence the title of the class. He encouraged us to share something special that we retained from one of the classes with our neighbors so that we could at least take that with us on our journey after the Conference. After, we practiced a meditation for gathering all mental activity and bringing it together towards the heart to be transformed into positivism and enriching thoughts and actions. Then, we did the “cocoon” meditation, imagining that we were covering ourselves with the feeling of love and light all around that spurred from within. We used our sticky mats as a prop to do a short asana practice to prepare the body for pranayama. These asanas prepared the body for opening up to breath and optimize the breathing process. And so we did the “whale pranayama” that combines deep inhalations, breath retention and a final active exhalation imagining that we were moving the breath from the lungs towards our belly and from our belly all the way up through the spine to be expelled from he crown of our head like the blowhole of a whale, covering ourselves with a feeling of love and the light emanating from within. It was a beautiful session and I am glad that I finally got a chance to participate in one of David´s now traditional “closing sessions”. Each year he brings a new creative proposal for concluding a beautiful weekend of Yoga and sharing. I wonder what he will plan for next year, can´t wait to find out! Did you practise the wale breath on a 9 count?